Natural-looking tan. Lasts 2 weeks. Non-tinted. 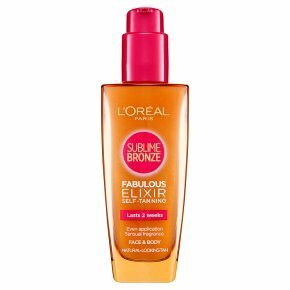 Even application, no self-tan smell.Innovation Long-lasting, self-tan elixir Discover our first self tan elixir that lasts 2 weeks*. Gives you an intense, golden tan for longer and fades evenly. *Instrumental test. Our highly concentrated formula locks in a natural-looking tan. The luxurious elixir glides effortlessly over your skin and is non-sticky. It dries quickly and develops evenly, no streaks or self-tan smell. Keep out of the reach of children.<br><br>Caution: Does not protect from UV light. Do not apply too close to the eyes. In case of contact with the eyes, rinse immediately with plenty of water.